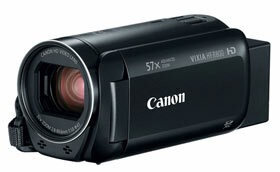 The Canon HF-R800 is Canon’s low cost Dual Flash Memory HD Camcorder. Records in full 1920 x 1080 Full HD Video (1080p). The 32x Optical Zoom Lens (57x advanced zoom) delivers excellent image quality and has SuperRange optical image stabilization (to keep video sharp in low light, or when doing handheld shots without a tripod). External Microphone Terminal and Headphone Jack. Included is a 1/4.85 inch HD CMOS Image Sensor, H.264, Cinema-Look Filters, 2 megapixel still images, and has a 24p, 30p and new 60p mode. The included External Microphone Jack will give you better sound options. The HF-R800 records at up to 35mbps using MP4 compression. At maximum HD quality , you can record about 2 hours to a 32GB SDHC/SDXC memory card. Camcorder turns on/off instantly when you open the LCD panel. Dolby Digital AC3 (2 Channel)sound. Pre REC Function: records the previous 3 seconds, so you won’t miss any action when you press the record button. Intelligent IS (image stabilization) system. This model has an HDMI Mini Connector (output) for best quality when hooking this camcorder directly to an HDTV. Features a 3.0 inch LCD touch screen (with 230,000 pixels). 3.28MP Full HD CMOS Sensor. Dolby Digital 2 channel (AC-3) stereo sound. 2017 Updates: Canon has added Slow & Fast Motion Recording, Highlight Priority Mode which can give you an HDR-like quality to your video. and prevents loss of detail in high brightness areas. Canon HF-R800 Dimensions: 2.1″ x 2.3″ x 4.6″ (10.9 ounces). Smart-Review Commentary: Canon’s HF R800 is Canon’s lowest cost HD camcorder, yet is packed with a lot of features. This model has a 32x optical zoom, and has an advanced mode to take it to 57x without loss of image quality. This model also has Canon’s SuperRange optical image stabilization to keep images steady, especially when you use the long zoom lens. . A surprising feature in a low cost camcorder is the inclusion of a External Microphone Jack which will give you more options for quality sound, and a headphone jack will allow you to monitor your audio. The camcorder can also record in .mp4 format for uploading to facebook, youtube, etc. The Canon R800 has a faster frame rate 60p mode, which is great for sports. This model has the new Digic DV4 processor. New improved longer life battery included. This is an excellent HD camcorder for the money and is a Smart-Review top pick.